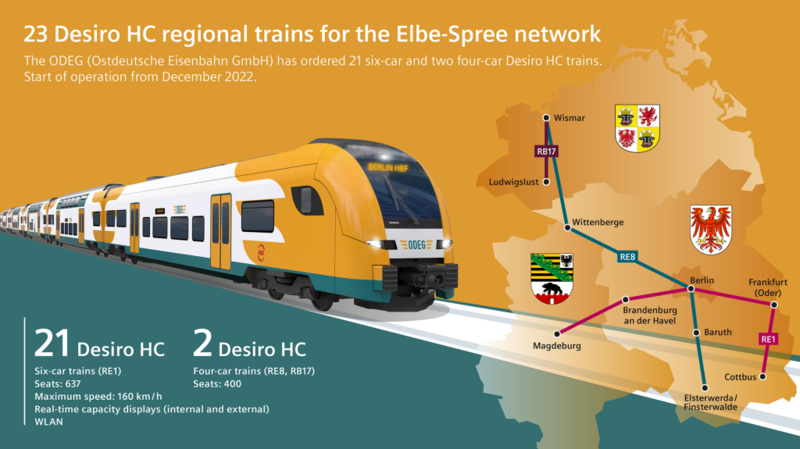 The image shows the regional train Desiro HC for the Elbe-Spree network. Ostdeutsche Eisenbahn GmbH (ODEG) has ordered 23 Desiro HC regional trains from Siemens for service on the Elbe-Spree network. The order is worth around €300 million. Delivery of the 21 six-car and two four-car trains is scheduled to begin in the summer of 2022. In January 2019, ODEG was awarded the contract to operate these lines following a Europe-wide tender by Verkehrsverbund Berlin-Brandenburg (VBB). The Desiro trainsets will be used on the regional express line RE1 (lot 1) connecting Magdeburg with Cottbus via Berlin and Frankfurt (Oder). During rush hours, trains will operate three times an hour between Brandenburg a. d. Havel and Frankfurt (Oder). The four-car Desiros are planned for service on the RE8 line connecting Wismar and Wittenberge with Baruth and Elsterwerda/Finsterwalde via Berlin, as well as on the RB17 line connecting Wismar and Ludwigslust.